"Lather. Rinse. Save the world." or "He'll blow you away." So just watched this movie... I liked it a lot, though comedies is best to see in a company, and not alone ;) Better to get a laugh that way! It's about Zohan who's a soldier[Super Hero style] in the Israeli army, but he only dreams of going to the US and become a Hair Dresser for Paul Mitchell. On his way to fulfill his dream he stumbles upon a few problems involving a "more than rich" business man, some terrorist, some wanna be terrorist and fashion. Good crazy plot,which ends the way most Sandler movies ends. All this just adds to a classic Sandler experience. Enjoy this movie and enjoy the 80's soundtrack featuring groups as Ace of Base and enjoy a good laugh. 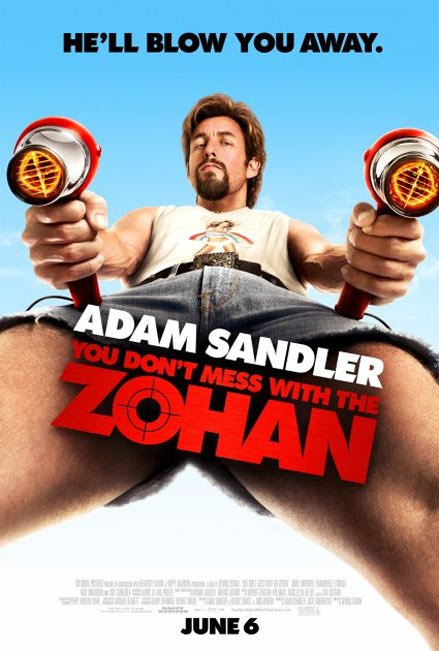 Bad guys: "Don't mess with the Zohan"